At the end of 2010, Mascus, the world’s leading online marketplace for construction, agricultural, forestry groundscare, material handling equipment and transportation vehicles, have signed their latest international license agreement for Mascus Thailand (www.mascus.co.th) The new agreement, with an affiliate company of Arimpex BV (who already have a license agreement with Mascus for the Benelux region and Canada), means Mascus now have local sales representation in 37 countries across 5 continents. “The fact we’re continuing to grow in spite of the continuing economic difficulties globally is a testament to how robust the Mascus concept is and how effective it is as a sales tool for our customers,” says Managing Director, Fredrik Larsson. Mascus is committed to doing business in Asia and Australasia for the long-term and over the last few years has been growing their Asian presence from two directions, Australia and China. 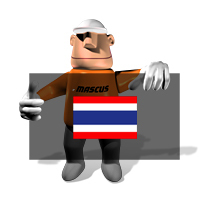 With sites already established for South Korea (www.mascus.co.kr), China (www.mascus.com.cn), Japan (www.mascus.jp) and Taiwan (www.mascus.com.tw), Mascus continue to build their global presence with local operations in Thailand and future development into Vietnam, the Philippines and Thaliand. Since starting in Thailand, Mascus has already achieved positive recognition and a growing number of visitors. With the new site they are expecting to attract more traffic and offer customers in Thailand global opportunities from a company that understands their local market. Mascus (www.mascus.co.uk) - Is an electronic marketplace for used farm machinery, forestry, and groundscare equipment and transportation vehicles. Product ranges include used tractors, used trailers, used trucks, diggers, box trailers, mini diggers and excavators. Mascus makes trading in used machinery and equipment quicker and more efficient by collecting in one place information about the supply and the demand. All dealers, producers, and end users are welcome to offer their used machines and equipment for sale via the marketplace. Mascus is a trading company of Alma Media Corporation.